The bee story continues with the UK now doing a complete review of the neonicotinoid situation. It is reminiscent of the foot-dragging that took place back in the early sixties when thalidomide fiasco broke out. The evidence kept gathering while apologists kept singing and the public swiftly became angrier. The public is not involved yet but it is not going to stay that way. The mere fact that it is effectively banned in Germany is telling as they were surely first adopters. The class action on this one may well cost Bayer massively since we are looking at what has been a massive destruction of the bee industry itself and that can be organized easily by lawyers. A little harder to qualify general losses as this has also affected wild pollinators also but their ability to perform may be much more robust. Remember neonicotinoids? They're the widely used class of pesticides that an increasing body of evidence -- including from USDA researchers -- implicates in the collapse of honeybee populations. Neonicotinoids are marketed by the agrichemical giant Bayer, which reels in about $800 million in sales from them each year. Germany (Bayer's home country), France, and Slovenia have either banned their use outright or limited it severely. Meanwhile, the U.S. EPA has stood by its approval of them -- even though its own scientists have discredited Bayer's research purporting to declare neonicotinoids safe for bees, and the USDA's chief bee scientist, Jeff Pettis, has reported doing research showing them to be highly harmful to bees even in extremely low doses. Good news: A government body is reconsidering the decision to approve those chemicals, based partly on concerns raised by Pettis. Less-good news: That government body is not our own; it's in the United Kingdom. Our own EPA has maintained its approval for the pesticides -- and farmers throughout the nation will soon plant tens of millions of acres of neonicotinoid-treated corn seeds, which will soon sprout into trillions of corn plants with neonicotinoid-infused pollen. Growing concern about the new generation of pesticides used on 2.5 million acres of U.K. farmland has led one of the Government's most senior scientific advisers to order a review of the evidence used to justify their safety. Watson's concern was triggered by two recent studies, The Independent reports. The first is Pettis' as yet unpublished study, whose existence was revealed by The Independent in January. The second, according to the newspaper, is new research from the French National Institute for Agricultural Research, which also found bees highly vulnerable to neonicotinoids in small doses. It appears that the pesticides compromise bees' immune systems, making them susceptible to a viral pathogen called nosema. Now, it's important to note that both Pettis' work and that of the French National Institute for Agricultural Research took place in the laboratory, not the field. 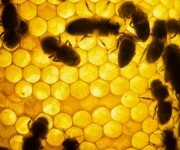 That is, they established that neonicotinoids theoretically pose a grave threat to honeybees. That's not the same as showing that they harm them in real-world, corn-field conditions. But given the decline of honeybee health, which roughly tracks with the explosion of neonicotinoid use in the late '90s, these studies show clear cause for grave concern. The coauthor of the Pettis study, Penn State University entomologist Dennis Van Engelsdorp, has stated [PDF] that their research found severe harm from neonicotinoids at extremely low levels, "below the limit of detection." He added: "The only reason we knew the [dead] bees had exposure [to neonicotinoid pesticides] is because we exposed them." What about field tests? The study presented by Bayer to show that the pesticides don't cause harm in real-world conditions has been thoroughly discredited. The EPA had accepted the study, after holding it without comment for two years; but then, last year, its own scientists downgraded it on the grounds that it was flawed, an internal EPA memo leaked in December showed. Apparently, to professional entomologists not on the Bayer payroll, the study was plainly shoddy. James Frazier, professor of entomology at Penn State, minced no words when I asked him about it in December. "When I looked at the study," he told me in a phone interview, "I immediately thought it was invalid." So we've got the theoretical possibility that neonicotinoids cause serious harm to bees even at extremely low levels; we've got one of the few actual field studies exonerating the pesticide declared invalid; and we've got a catastrophic decline of a species critical to agriculture that coincides with the rise of said pesticide. You don't have to be Sherlock Holmes to conclude that there's sufficient evidence to halt its use and subject it to rigorous, independent field study. They're at least considering that course of action in the United Kingdom. And they're taking USDA scientist Pettis quite seriously. True, his research remains unpublished two years after it was completed. He has told me in emails that his study is in the review process for publication, but has no release date yet. He emphasized that the "delays are on my end; not a conspiracy to keep my data from seeing the light of day." Delayed or not, Pettis' research has inspired the U.K.'s version of EPA to publicly review its decision to green-light neonicotinoids. Furthermore, Pettis "sits on a panel of leading experts who will review a £10m [$16 million] research initiative into the decline of bees funded by Defra, two of Britain's research councils, the Wellcome Trust and the Scottish Government," the Independent reports. He'll also address the House of Commons next month to "present his findings on neonicotinoids to MPs concerned about the possible link between the pesticides and the demise of bees and pollinating insects." Tragically, it's probably too late to stop the planting of neonicotinoid-laced crops during this spring's growing season. But the long-term health of our pollinators -- and the health of the vast swaths of agriculture that rely on them -- demands serious attention to the mounting concerns about this highly profitable and ubiquitous class of pesticides.